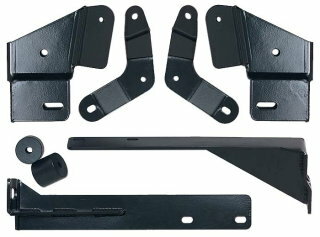 Combo kit includes both the RE9900 drop brackets and the RE9905 support braces. Cherokee control arm relocation brackets are used to relocate the upper and lower control arms approximately 3" lower and 1/2" forward of their factory position. The reduction in control arm angle improves the lifted ride and handling substantially. We recommend they be used in conjunction with the RE9905 support brackets on XJ model Cherokees. The RE9905 braces are used on XJ model Cherokees for added support on the RE9900 brackets. These brackets tie and triangulate the RE9900 brackets back into the uni-body frame rail at the transfer case mount.